Technicians and installers need to have reliable tools, and we offer tools that make your job easier. Compression connectors are quickly becoming the standard for home theater, cable television and satellite installations. 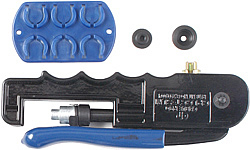 This compression tool is a must for installing compression connectors on coaxial cable. Designed to easily change between “F”, RCA and BNC type connectors. Get rid of your multiple, bulky compression tools! The F-Conn compression tool fits comfortably in your hand, provides single hand operation, and includes all the necessary tips to compress all the F-conn connectors including right angle connectors, wall plate inserts, and speaker connectors.